It sounds so cliche, but many people are focusing on how they will improve their health and wellness now that we’re in a new year. To be honest, I don’t blame them, and I actually fall into that camp as well. Your health should be a top priority because you can’t meet many of your other goals if you aren’t in good health. If you are ready to turn over a new leaf this year and start improving your health and becoming fitter, I’m right there with you. Your first step is to become more active. This doesn’t always mean heading to the gym. If you’re not a gym person or don’t want to spend money on an expensive membership, you can always take action at home or outside in your neighborhood for free. On most personal finance websites, people will argue against having a gym membership and claim that it’s an unnecessary expense. I agree that if you can’t make the minimum payments on your debt or pay your light bill that you probably shouldn’t have a gym membership, but since health is a major priority for me, a gym membership is a must nowadays. If you really value it, you should make room in your budget for the expense. On the bright side, heading to the gym doesn’t have to cost you an arm and a leg each month. You don’t have to go to one of those fancy gyms with state-of-the-art equipment, flat screen T.V.s, and an upscale cafe. My gym membership is only $36 per month and it includes unlimited access to the fitness room and track 7 days a week, and unlimited access to group fitness classes, but honestly, there a lot more options, some people save money and start building their home gym, with a couple of dumbbells and a bike like the one at www.basictrainingsf.com/best-recumbent-bike/ you have enough, you can do weight trainning and cardio from home. Just make sure you’re going to the gym and getting your money’s worth. Paying for a membership actually motivates me to get up and go workout even when I don’t want to. I used to have trouble with drinking water because I was addicted to sugary drinks. However, I started infusing my water with fruit and it made all the difference. Now, I just buy a lemon or some strawberries to infuse my water to add some extra flavor to it, and I’m less likely to reach for the sugary drinks. This is easier said than done, but it’s important to get the proper amount of rest each night if you want to look and feel healthier. If your schedule is too packed and it’s affecting your sleep schedule, it’s time to let something go. Re-evaluate your priorities and try to get at least 8 hours of sleep, whether it’s waking up later or going to bed earlier. I know that sometimes the hustle calls, but I’ve learned first hand that can take a toll on your body. Before I started sleeping more I felt so busy that I’d only get 6 hours of sleep each night if I was lucky. By Friday, I was so worn out that I’d come home and sleep for hours just to catch up. Once you make sleeping more of a priority, you’ll start to have more energy to exercise and do other things. I’m not a big fan of diets, so I can’t really say what the next big fad will be this year. If you are trying to lose weight, there’s just one simple formula to follow. You need to burn 3,500 calories in order to lose 1 pound per week. That essentially means you need to burn around 500 calories per day. You don’t have to run a marathon to do it either. Changing your eating habits will provide a big benefit. No need to commit to a fad diet or start making nasty juices. I used to have it stuck in my head that I had to clear my plate entirely before I stopped eating. That’s what my parents always taught me growing up. However, restaurants tend to serve large portions, so I realized I needed to stop eating once I feel full and put the rest of my food aside for later. My guilty pleasure foods were sugary drinks like lemonade, sour candy, and popcorn. Since an 8 fl. oz. glass of lemonade is probably around 100-140 calories and packed with sugar, I was easily on my way to cutting 500 calories for the day by skipping the several cups of juice I’d drink. Swapping your troubled foods out for healthier alternatives doesn’t have to cost an arm and a leg either. I ditched juice for water, traded candy for fresh fruit and raw nuts, and while popcorn is hard to give up, I still eat it sometimes, but choose to snack on pomegranate seeds instead when I watch a movie. Improving your health and wellness this year will be a challenge, but you don’t have to make it complicated for your finances. Don’t try to recreate the wheel with expensive fad diets, protein powders, and activities. 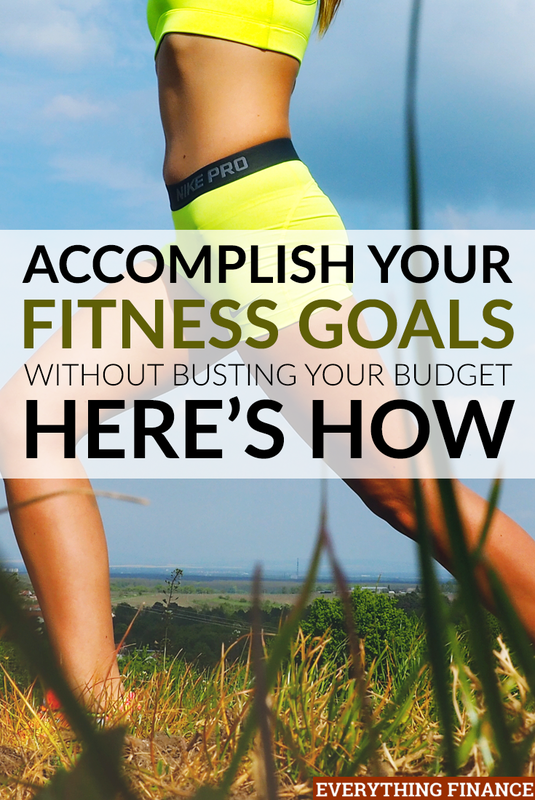 How do you plan to keep up with your health and wellness goals?